Honest, reliable and erudite moving services for the DC Metro area. Bookstore Movers was started in 2005 as a way for fellow employees of an independent used bookstore on Capitol Hill to earn some additional money so that one day they might collectively have enough to purchase the bookstore when the current owner retires. We provide high-quality moving services by trustworthy and intelligent movers to the Washington, DC area. We do residential and commercial jobs, and are ready to help out with everything from moving and storage container loads/unloads, to studio apartments, to full service 2-3 bedroom moves. We’ve done thousands of moves now and have thousands of very happy and usually pretty ecstatic customers (check out some of their testimonials here). We love what we do, and we are very good at it. 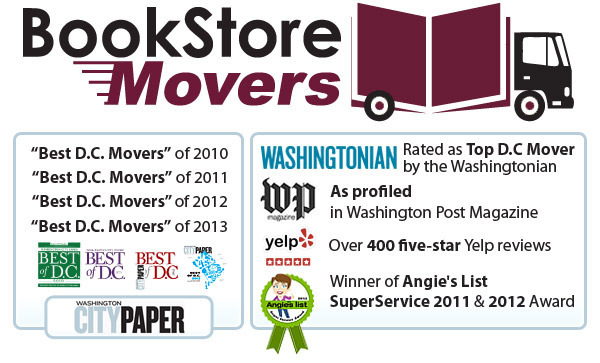 In fact, we have been awarded the title of “Best DC Movers” by the Washington City Paper *four* years in a row now, for 2010, 2011, 2012 and 2013. We were also recently featured in a piece by Washington Post Magazine, and in another by the local DC publication, Roll Call. And most recently in a Washingtonian Magazine article about the "Top Movers" in the DC area.